Conventional middle and rear steel bins for granular products. 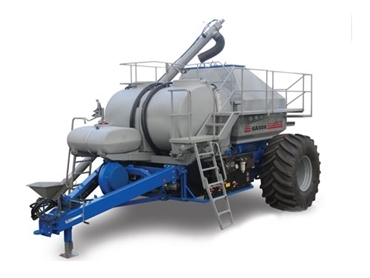 This enables the application of both liquid and solid fertiliser with the seed. A 500 litre fresh water flush tank is standard on all liquid equipped seeders with the option for a 500 litre trace elements tank and variable rate injection pump. A dual pump system is supplied as standard to meter product and to offer a high degree of mixing via the 4 in-tank agitation nozzles. An optional second meter control system is available to allow 2 incompatible liquids from the main tank to be metered and distributed right through to the ground.